Friday night: Clouding over with a few showers late. 60s. Saturday: Periodic rain. Some heavy. Low 70s. Sunday: Fewer showers. Low 70s. While the work week ends on a beautiful note, clouds and showers arrive just in time for the weekend. As early as Friday evening, clouds will stream up from the south, with showers breaking out overnight. Lows will be in the 60s and 70s in southern New England, where the clouds are thickest and arrive first. In northern New England, clear skies hold on longer, so temperatures drop into the 50s and 60s. Both weekend days will be similarly hard to plan for. The weather won't be very dependable, meaning showers and periods of rain will be moving around somewhat at random. Areas in far northern New England, right near the U.S. border with Canada, will enjoy mostly dry weather with a fair amount of sunshine. Highs there will be in the 80s. On Cape Cod and the islands, we'll see lots of clouds, but some breaks of sunshine, and only spotty showers. So while it won't be the most beautiful beach weekend, it will be far from a washout. Temperatures will be in the 70s thanks to an east wind with humidity creeping back in. 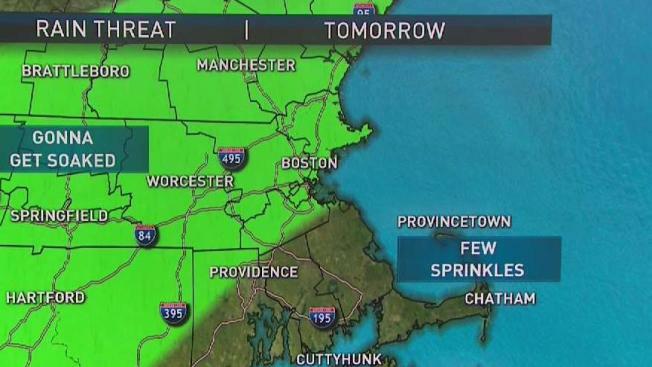 The rest of New England will be mainly cloudy and occasionally wet. The rain will be most widespread in parts of Connecticut as well as in central and western Massachusetts, as we see it right now. There may be some localized flash flooding in those spots that are hit repeatedly by rain. Many outdoor plans will still be able to continue, but it would be safest to have a backup plan inside or under cover in case rain passes by during your event. Next week still looks more humid with temperatures in the 80s. Scattered storms will be around early in the week, as well.